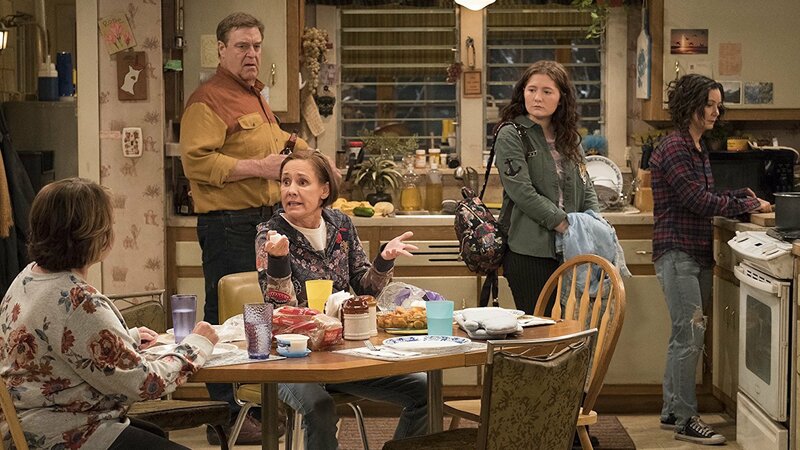 Good news, Roseanne fans: The Conners are back, and while the new show will not feature the original series' namesake character, many fans cannot wait for this spinoff to air. Of course, we knew The Conners would be back. ABC announced plans for the spinoff series on June 21. 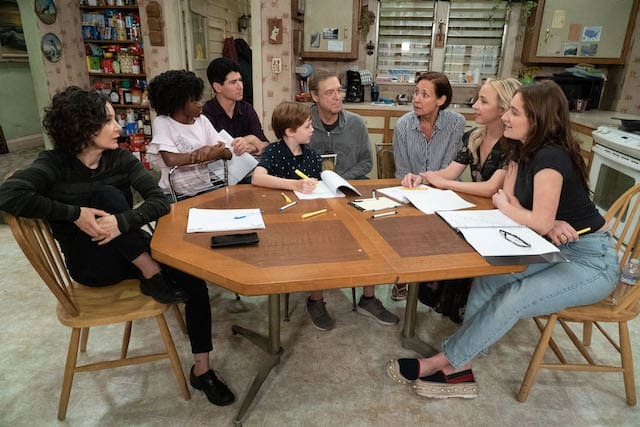 However, early Friday morning, the network released a photo of the cast on set, and the image — which shows Sara Gilbert, Jayden Rey, Michael Fishman, Ames McNamara, John Goodman, Laurie Metcalf, Lecy Goranson and Emma Kenney gathered around the family's infamous kitchen table — is getting a lot of attention. That said, it's hard to ignore the elephant in the room: comedian Roseanne Barr's glaring absence. (Barr was terminated — and her show was canceled — after she wrote a racist tweet about former White House adviser Valerie Jarrett.) However, The Conners will confront the issue when it returns and, if a recent interview with Goodman is any indication, the show may take a dark path. "I guess he’ll be mopey and sad because his wife’s dead,” Goodman told The Sunday Times. ABC has not confirmed whether Goodman actually spoiled the big reveal of how Barr will be written off the show. An official synopsis for the show reads, "After a sudden turn of events, the Conners are forced to face the daily struggles of life in Lanford in a way they never have before. This iconic family — Dan, Jackie, Darlene, Becky and D.J. — grapples with parenthood, dating, an unexpected pregnancy, financial pressures, aging and in-laws in working-class America. Through it all, the fights, the coupon cutting, the hand-me-downs, the breakdowns — with love, humor and perseverance, the family prevails." The Conners will premiere on Tuesday, Oct. 16 at 8/7c on ABC.